Five Blades to more evenly distribute pressure for a more comfortable, less irritating shave. Vitamin E and Aloe lubricating strip reduces skin irritation. Guardian Trimmer blade for hard to shave areas like goatee, sideburns, under nose and back of neck. 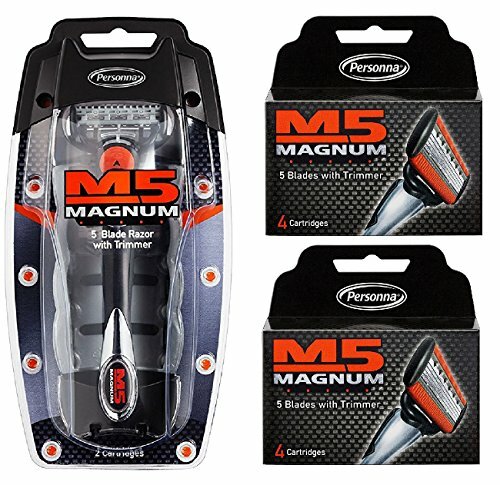 The Personna 5 Blade m5 Magnum Razor provides a close, clean shave. It is equipped with five sharp blades for a smooth and even cut. The 5 blade razor 4-pack provides convenient refills for when you need them most.